The Roman Empire exists for almost 1,000 years. It is, however, but a pale shadow of what it used to be in the times of Caesar or Trajan. The World is changing and new powers are rising; soon they will begin to harass and attack the Roman lands. Deep within the impenetrable and dark forests, which stretch beyond the rivers of Rhine and Danube, live brave Germans, who turn their greedy eyes on rich towns and villages spread across the Roman provinces. It would be, however, a lot easier to pillage and conquer if not for rivalry and constant wars between tribes and warbands. 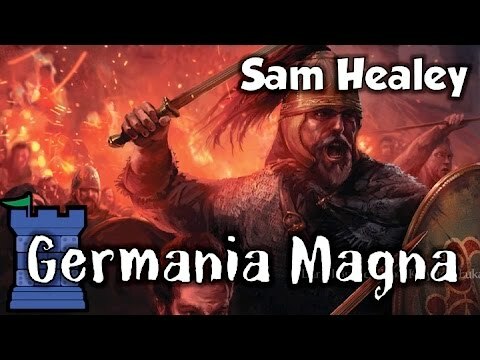 Germania Magna: Border in Flames is a game of shifting alliances. Each player assume the role of a Germanic warlord leading his warriors into Roman provinces, which lie across the Rhine and Danube rivers. The Roman Empire is still too strong to be conquered, but its fields and cities provide loot for your warriors, and its armies give you an excellent opportunity to prove yourself as a worthy leader and, by doing so, to achieve eternal glory for yourself. The enemy is very powerful, so to win you need to forge alliances (however fragile) with other warlords, who will switch sides each time the tide of war changes.